Featuring a 1064 nm Nd:YAG laser and up to 26,333 watts of peak power, the Candela GentleYAG is among the fastest and most effective cosmetic laser systems you can buy. This model is suitable for laser hair removal, skin rejuvenation, facial veins, leg veins and more. Like all the pre-owned Candela laser machine systems we sell, it offers the popular DCD (Dynamic Cooling Device) feature for added patient comfort and safety. Just about every manufacturer claims to have a fast cosmetic laser, but Candela backs that up with a spot size of up to 18 mm and a repetition rate of up to 2 Hz. You simply won’t find that combination on another cosmetic laser system at this price. 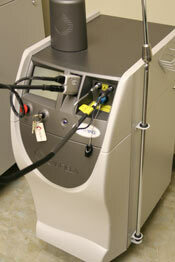 To get a pre-owned Candela GentleYAG laser machine at the lowest cost, contact us today for a free price quote. At SunrayLaser.com, you will not only find a pre-owned Candela GentleYAG at an affordable price, but you will get the security of our 100% satisfaction guarantee. We are that confident in our cosmetic laser equipment because we thoroughly recondition, inspect and test everything we well. If it doesn’t make the cut, then we simply will not offer it for sale. Even if you are just doing some comparison shopping and looking for the lowest price on a used Candela GentleYAG laser system, we are happy to provide a price quote with no obligation. All you need to do is fill out the form below and we’ll respond promptly with Candela GentleYAG pricing information.